Fall is here. 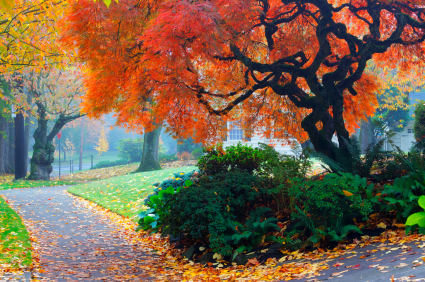 We were soaking up the sun in Hawaii when Fall officially arrived to the NW. We got back to cooler temperatures, leaves turning colors and pumpkin everything. It seemed too soon and out of place. But after a week or so of being home, I started to settle in and welcome the coming autumn weather. Cozy sweaters, fires in the fireplace, hot tea, and soup. Lo and behold, I didn’t hate spinach. I just hated the frozen spinach slop defrosted in a microwave and used as a side dish at dinner. Ever since then I’ve found that I actually quite like it and it went GREAT in this recipe. It was one of the highlights I think. I cooked the veggies in a skillet and heat the tomatoes and broth in a separate stockpot. It’s actually a wedding gift! Le Creuset stock pot from Michael’s coworkers. Very generous gift that we will use often. This was the maiden voyage of said pot. 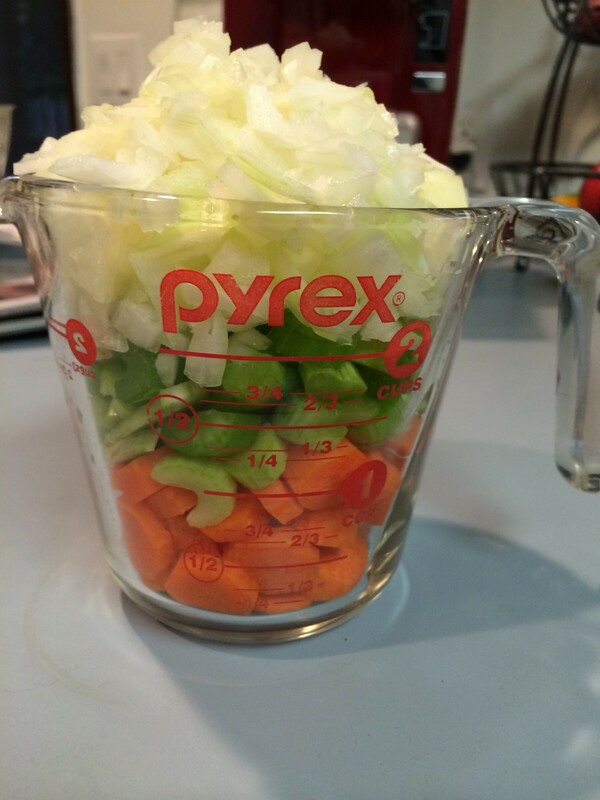 So I cooked the onions, carrots and celery separately and then added that to the stockpot of broth. The recipe was vegetarian but had options to make it not vegetarian. I didn’t have vegetable broth so I used about 1 cup of leftover beef broth and the rest was chicken broth. I had some leftover hamburger meat I needed to cook up so we browned that in the skillet with the garlic and then added that to the pot, too. I’d say it was roughly about the amount you’d use for one hamburger. It wasn’t much and I wish it had been a little more. 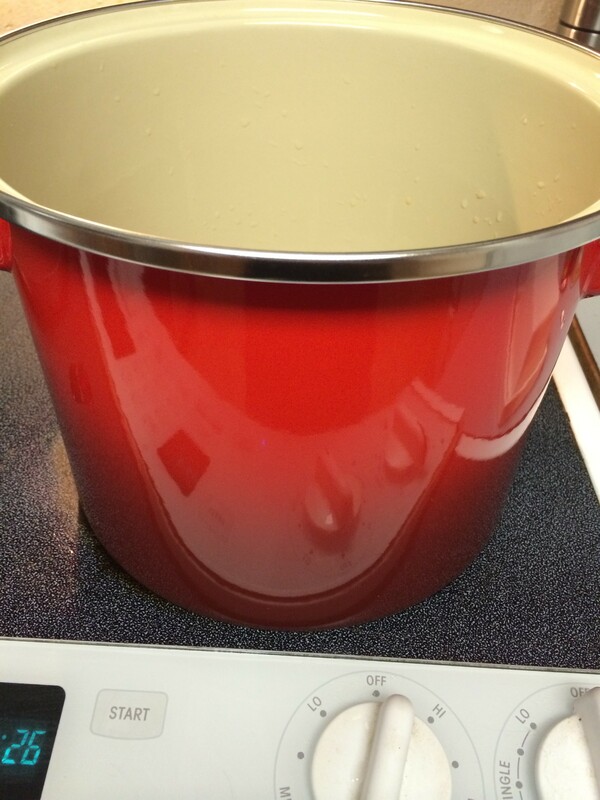 Heat oil in a large stockpot over medium-high heat. Add onion and saute for 4 minutes, until soft. 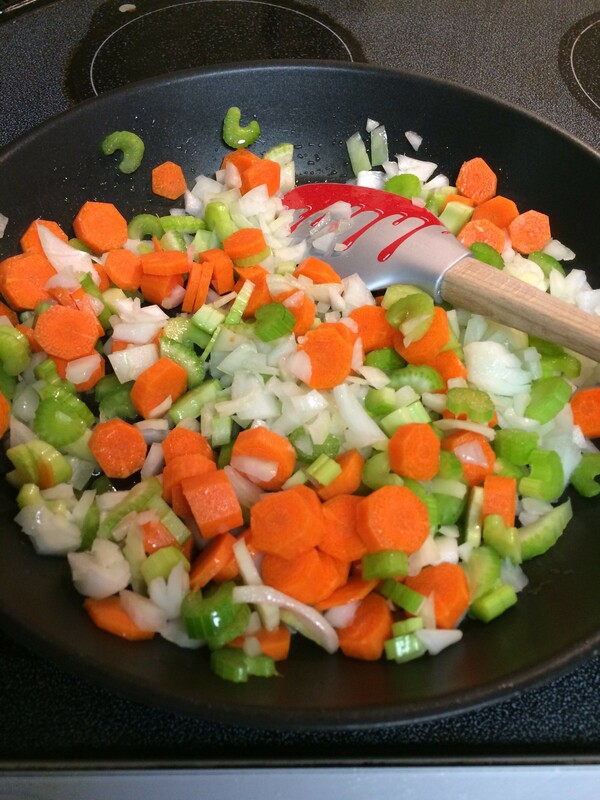 Add carrots, celery and garlic and saute for an additional 3 minutes. Add chicken stock, tomatoes, orzo (pasta), thyme, oregano, rosemary and stir to combine. Bring soup to a simmer, stirring occasionally. Reduce heat to medium-low and simmer for 10 minutes, stirring occasionally, until the pasta is al dente. Stir in the spinach and cook for 1-2 minutes until it is bright green and wilted. Season with salt and black pepper to taste (if needed). Serve warm. I’ve never had orzo before (shocking) and I liked it a lot! Kind of a cross between brown rice and tiny pasta…I got roughly 7 servings out of this recipe. 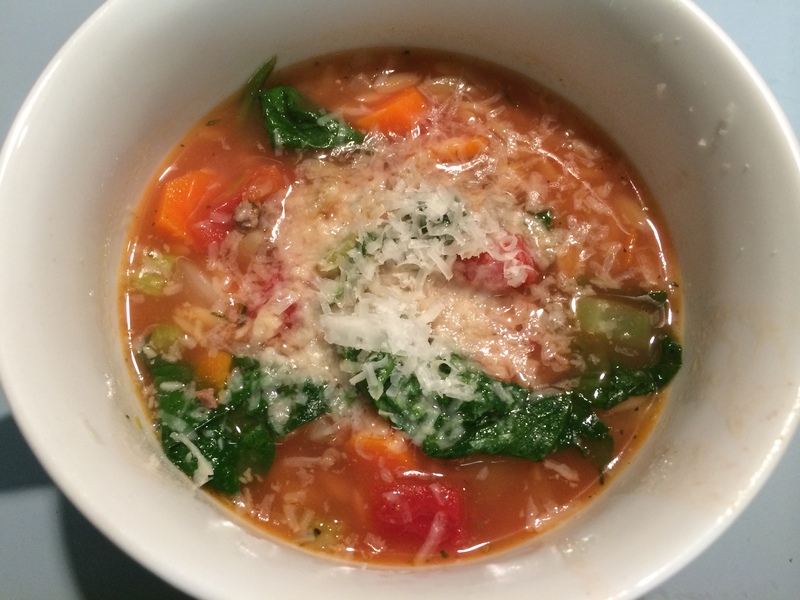 I topped the soup with some freshly grated Parmesan cheese. Michael said it was okay; I liked the recipe a lot but I’d make one change: I’d use spicy ground pork in it. I think the spice would go great with the rest of the flavors. So while the evening darkened outside and we settled in to watch The Walking Dead, we ate our soup and felt it warm us from the inside. I love soup weather! We shared a few glasses of a sweet, smooth Malbec wine and it went perfectly with the soup. I had some leftovers that I ate for lunch during the week. It was less soupy then because the orzo soaked up most of the broth. Despite that, it was still really tasty and it might even have been better the next day. I liked this dinner and would make it again. I’d probably also make some biscuits to go with it. Perfect fall meal for not many calories!